As always, readers are responsible to perform due diligence with official charts, cruising guides and online cruising resources to verify the navigation and piloting informations presented in this post. The Atlantic-ICW transits the Southern Branch of the Elizabeth River through Norfolk, VA, and Portsmouth, VA. There is no practical way around it. South-to-north, the portion of the Southern Branch from Deep Creek, VA, (south) to Willoughby Bay at the entrance to the Chesapeake Bay (north) is one of the most active and busy commercial and heavy industrial waterways on the entire East Coast. Sanctuary’s crew feels this stretch of the A-ICW greatly exceeds NY Harbor in piloting complexity. This stretch is relatively narrow, the port facilities are closely quartered, and there is an extraordinary diversity of pleasure craft, commercial traffic and military maritime interests operating in the area. There are all manner of large and small work boats, tugs alone, tugs with barges, harbor pilot boats, bulk cargo vessels, container ships, US Navy Warships, US Coast Guard operations, dredges and pipelines, tour boats and water taxis operating on the Elizabeth River. There are oil, gasoline, coal, grain and quarry docks, and many dry goods dock facilities for large ships. Added to that mix, there are also all sizes and speeds of pleasure craft. For the pleasure craft operator who is not familiar with theses waters, a transit can be a time of high anxiety. There are at least three automated railroad bridges that can delay river traffic for significant periods of time. Of these, Norfolk & Southern Bridge #7 on the Southern Branch of the Elizabeth River is by far the most difficult remaining impediment to cruisers, as it affects the ICW route and accommodates a very busy and active mainline railroad freight route. (N&S Bridge #5 is on the Eastern Branch of the Elizabeth River, and does NOT affect ICW passage.) Another is the Norfolk & Portsmouth Belt Line RR Bridge, known locally as the “Belt Line Bridge.” There is no place to anchor or tie up while railroad bridges are closed, so pleasure craft operators must be able to keep station, regardless of wind or weather conditions or tidal ebb and flood currents in the river. Marine security in the area is high and visible. VHF chaNNELS 16 and 13 are constantly a-squawk with the names of local landmarks, locations and piers that only local maritime professionals are likely to know. These will largely mean nothing but anxiety to the visiting through-cruiser who is not local to this area. Maintain a vigilant visual watch, expect large wakes, and always be prepared to yield to others. Commercial traffic has no patience for pleasure craft, and except in “no wake” zones, will not slow for us. Tug boat prop wash can easily throw a pleasure craft into a 360º spin or into a sideways slide off course. Cruiser’s on this stretch of river waterway must be vigilant and always on high alert. In practice, if not in law, when it comes to pleasure craft, the nav rules are trumped by local custom. There is no such thing as “stand-on vessel” or “right of way,” but there is definitely the “law of gross tonnage.” As much as anywhere, it’s up to pleasure boat operators to be patient, stay out of the way and out of trouble. There is no large vessel traffic at Annapolis harbor, but there are military training (YP) vessels that operate from the navy base at the Naval Academy. There are also large US Navy sailing vessels operated by Naval Academy midshipmen. Those sailing vessels are US Navy commissioned vessels, and pleasure craft must stay clear of them. The two big navigation hazards in Annapolis are both in the category of pleasure craft. First, private sailing vessels will force the “stand-on” and “give way” rules to the hilt, simply because they can. And second, there are sailing training schools for kids and teens that teach their “students” that sailing vessels have the “right-of-way.” These “student sailors” do downright dangerous things under the assumption you can and will be able to avoid them. On one Wednesday evening occasion, I literally dropped our anchor to raise my “right-of-way” priority and protect myself from their dangerous operations. The bad news is, they learn that behavior from “adult” sailing training instructors (who behave that way themselves). Baltimore Inner Harbor is a busy harbor, but not as complicated as Norfolk/Portsmouth. 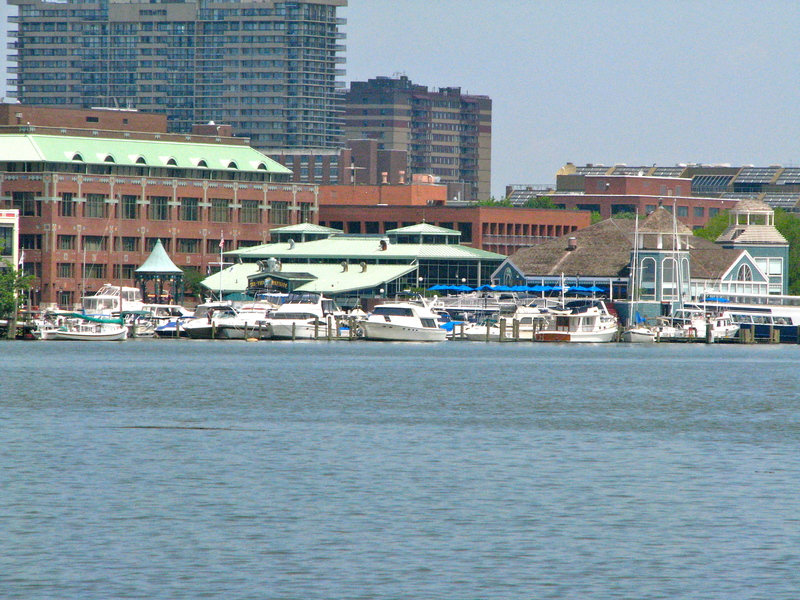 The Patapsco River and harbor approaches to Baltimore are wide, and pleasure craft can easily operate outside and away from the shipping channels. Like New York, the commercial port areas of Baltimore are not located near points-of-interest to pleasure craft. Visual watch and situational awareness remain important, but piloting is generally easier than Norfolk/Portsmouth. By the time pleasure craft reach Inner Harbor, there is no longer any large commercial traffic. Finally, the Chesapeake and Delaware Canal is a Vessel Traffic System (VTS) controlled-access waterway with ocean-going tugs, barges and large ships. Mandatory-compliance vessels must check-in with VTS. Pleasure craft are not required to check in, but would be wise to monitor the VTS working VHF channel. The C&D Canal is frequently affected by early morning fog. Listen to the VHF well in advance of arrival at the canal for possible restrictions and/or closure information. The canal is narrow, speed controlled, and tidal currents can be very strong. In the canal, tidal currents are with respect to the Chesapeake Bay; flood sets eastward towards the Chesapeake Bay, and ebb sets westward to the Delaware Bay. Monitor VHF 13 carefully in this commercial waterway. The Portsmouth/Norfolk waterfront along the Elizabeth River offers several great stops. There are private marinas on both sides of the harbor, and water taxis to transport cruisers back-and-forth between Portsmouth and Norfolk. On the Portsmouth side, there are two public boat basins where cruisers can tie up for free. There are no electric or water services in these basins, but there is a free pump-out station in the north basin (N 36.83282, W -076.29663). These basins are a good place to wait out heavy weather. Take care not to tie up where water taxis and harbor cruise boats have reserved docking. Maximum allowed boat LOA is 40′. The High Street basin has room for 6 – 8 boats, depending on the care owners take in space utilization and courtesy for others. The North Basin is slightly larger but has less room for pleasure craft. These areas are highly foot-trafficked, but boat and personal security is not a concern at this time. Vigilance in situational awareness and responsible security precautions are recommended. High Street provides easy walking access to several restaurants, including an Irish Pub and a fabulous German Biergarten. There is a pleasure craft anchorage at Hospital Point on the Elizabeth River (N 36°50’44.3″, W 076°18’01.4″). The anchorage is in a “no-wake zone” that is largely honored by local traffic, and generally quiet after dark. Violators are always other pleasure craft who claim “they didn’t realize.” On the Norfolk shore, Waterside Marina is on a Riverwalk and is the most convenient place for a visit to downtown Norfolk. 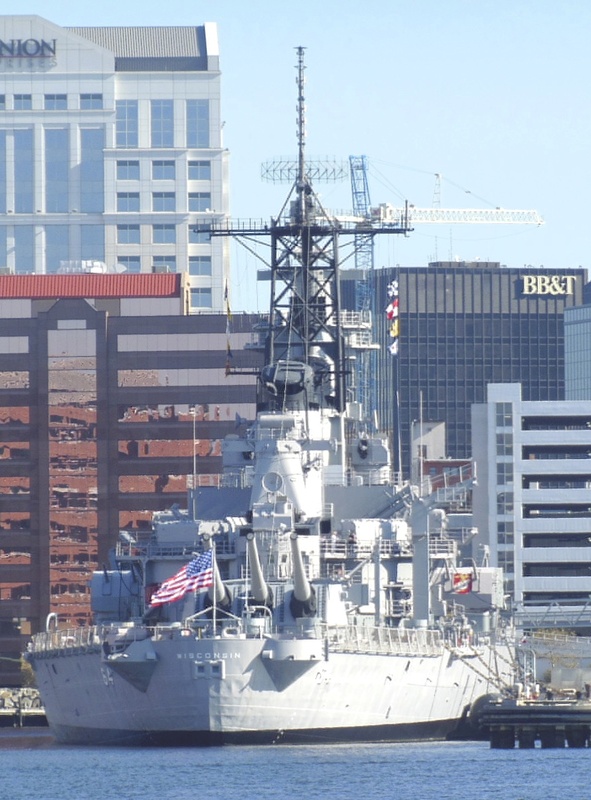 Visit the USS Wisconsin, a WWII Battleship museum just a couple of city blocks from Waterside Marina. Heading north from Norfolk to the Chesapeake Bay, cruisers will pass the Norfolk Navy Yard to starboard; favor the red side of the channel. The Navy security patrol boats will be somewhat less interested in you if you travel that side of the channel, farthest off the Navy docks. Northbound, the last docks on the north end of the Norfolk Navy Yard are for Nimitz-Class nuclear-powered aircraft carriers. In May, 2015, the USS Eisenhower (CVN-69) was at Portsmouth and the USS George H. W. Bush (CVN-77) was at Norfolk. Old Point Comfort, James River, Hampton, VA. While passing the Navy Yard piers, cruisers will be looking northward at the north shore of the James River. 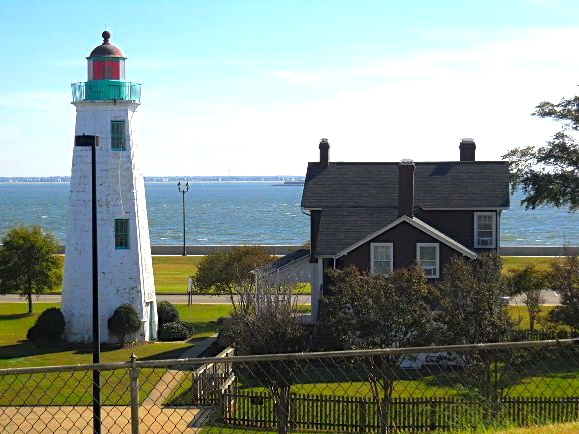 The City of Hampton, VA, lies ahead at 0º, Old Point Comfort Lighthouse lies ahead at 15º, and Willoughby Bay lies abeam to STBD at 80º, immediately past the Navy piers. Hampton is an excellent harbor-of-refuge if the Bay “is up.” There are good marinas, including the Hampton Public Pier, and a secure anchorage, in the Hampton harbor. From Norfolk, we definitely recommend that cruisers visit Tangier (Island), VA. The Chesapeake Bay (West) approach (N 37°49’55.02″, W 075°59’57.24″) to Tangier carries 7-1/2 ft of water at low tide, and the Tangier Sound (East) approach (N 37°50’22.96″, W 075°58’19.89″) carries about 10 ft, but is subject to shoaling. There is no place to anchor, so visitors will stay at Park’s Marina for $30 per night, with electric. Milton Parks is a treat! Milton will take visitors all over the island in his golf cart. Tangier is a step back into the early 20th Century, and a real look at the lives of Chesapeake Bay Watermen. You will also discover that Tangier Island holds a very significant position in the military history of our Colonial and 1812 period. Tangier is a wonderful stop, and well worth the time. 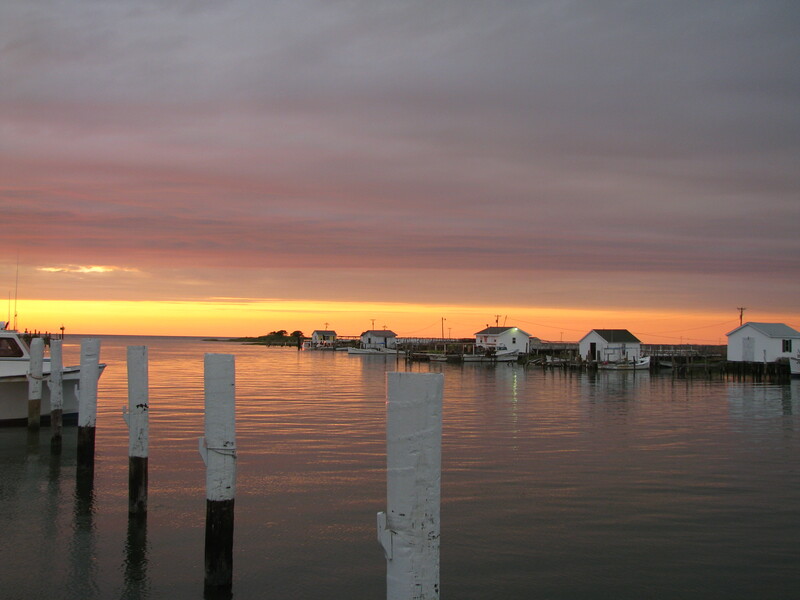 From Tangier, we suggest a stop at Solomons, MD. There are several marinas there, all 3 star. Plenty of anchorages. Definitely while here, see the Calvert Marine Museum. Lots of good eats locally. There is also a large, well stocked West Marine chandlery, including a splicing shop. From Solomons, stop at St. Michael’s, MD. 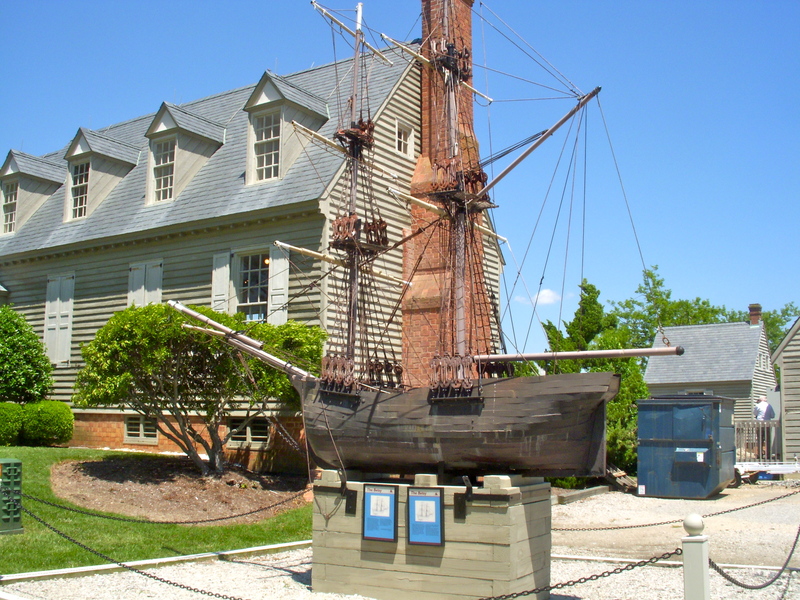 St. Mike’s is the home of the Chesapeake Bay Maritime Museum. CBMM is a truly world class maritime museum, and a “must see.” St. Mike’s is a “touristy” stop, and a very nice, unique “Eastern Shore” town, with several pub food restaurants. St. Mike’s marinas are upscale and expensive by Chesapeake Bay standards. There is a large anchorage just outside St. Mike’s harbor, on the Miles River (N 38°47’12.3″, W 076°12’41.9″). A water taxi serves the anchorage from about 08h00 to about 22h00 daily in the summer months. We are members of the CBMM, so we dock there. But if I weren’t, I’d anchor out and use the water taxis. Annapolis Historic District, Capitol of Maryland, viewed from the waterfront. 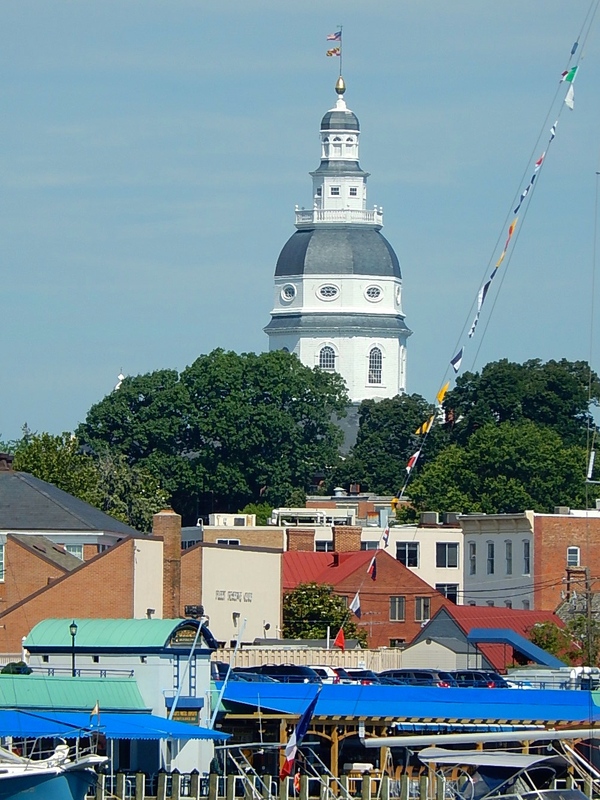 Next, stop at Annapolis, Maryland’s capitol city. The private marinas of Annapolis are expensive compared to regional averages. There is a city marina along “Ego Alley,” first come, first served. Early in the day arrivals should find space available. Alternatively, there is a large mooring field, for $25.00 per night, I think. A water taxi service serves the harbor and will pick boaters up at their mooring and drop off anywhere along the waterfront at Annapolis or Eastport. The area surrounding the waterfront and the capitol complex is the “Historic District,” similar to Charleston’s “Battery” for building preservation. Absolutely, definitely, have breakfast at Chick ‘n Ruth’s Delly at 165 Main Street. BE AT CHICK ‘N RUTH’S BEFORE 08h30 WEEKDAYS OR 09h30 WEEKENDS. Wednesday’s, upstairs at Chick ‘n Ruth’s, is the weekly “Cruisers Breakfast.” Tables are reserved for “CLODS;” i.e., “Cruiser’s Living On Dirt.” Other cruisers there can tell transient visitors what’s happening in town on a week-to-week basis. Cruisers needing a ride for re-provisioning or a trip to Fawcett’s chandlery or West Marine, can probably get one there. There is an excellent and wide variety of local restaurants, of course, and lots to see an do. 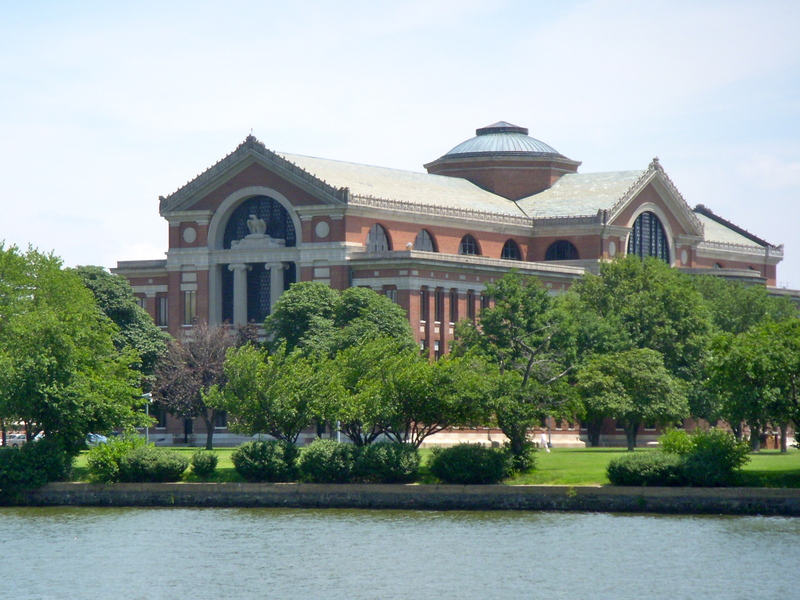 Definitely take the tour of the Naval Academy. Visitors will need two forms of picture ID to get on post, so bring passports AND Driver Licenses. The public is welcome at religious services at the Naval Academy “Chapel;” it’s really more of a cathedral. That is something to see!!! USS Whidbey Island, Baltimore Inner Harbor City Docks, and our Sanctuary, during Fleet Week, August, 2010.
been discontinued; check for it). Electric at the city docks is $4.00/pigtail/day. So, a single 50A pigtail is a better deal than two 30A pigtails. The Inner Harbor City Dock does not take reservations. Our strategy is to arrive at Inner Harbor by 11h00 or so in the morning to have a choice in slips or wall space. 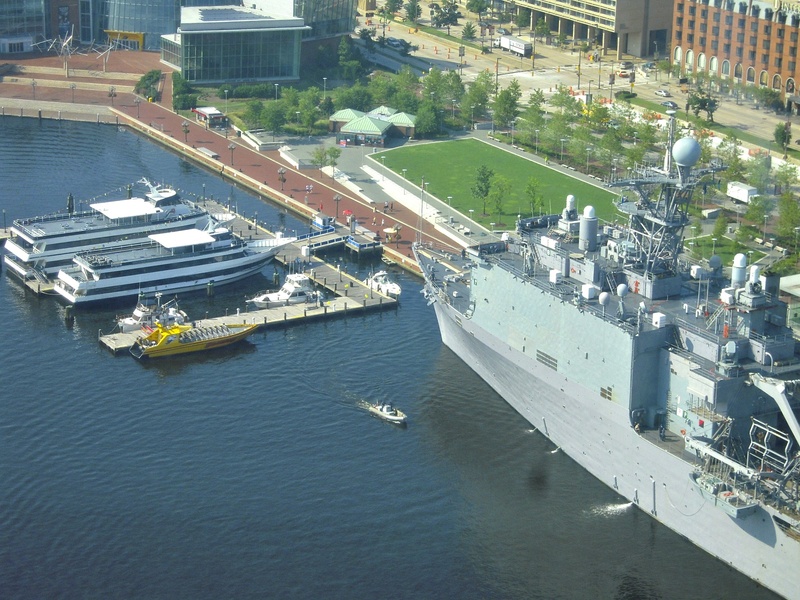 There is a private marine at Inner Harbor, but much more expensive. Length-of-stay at the city docks is not limited. 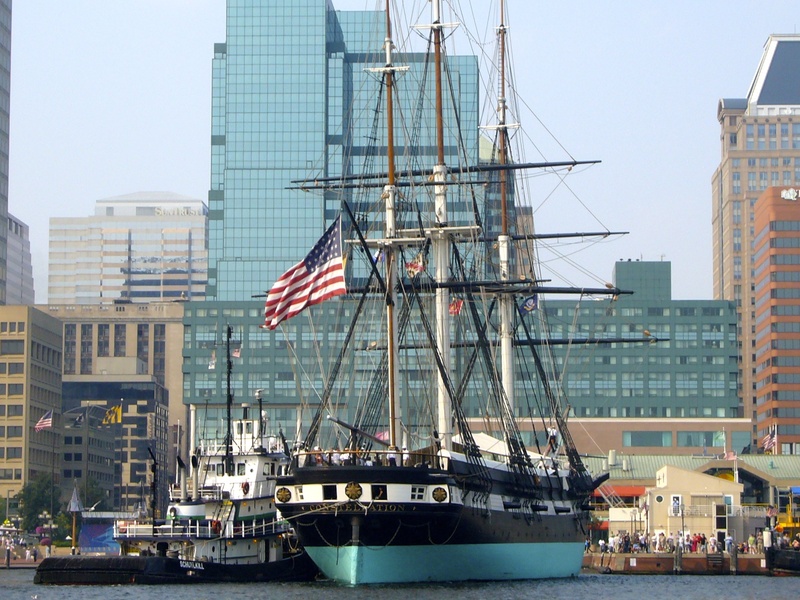 Visit the entire harborwalk; USS Constellation, Science Museum, Aquarium, USCGC Roger B. Taney, Hard Rock Cafe, Hooters, many other POIs. There’s something there for everyone. If you like baseball, check the Baltimore Orioles home schedule; it’s an easy walk to Camden Yards from Inner Harbor (4 – 5 blocks). Locate the Inner Harbor City Docks ahead of time on Google Earth. At the northern end of the Bay, plan to stop at Chesapeake City on the Maryland end of the C&D Canal. As you enter the basin at Engineer’s Cove, watch for nav markers in what appear to be strange locations. The mouth of the cove shoals from the ship traffic in the canal, and that shoaling is always changing. There is a floating dock to the west side of the harbor entrance with space for 4 to 5 boats. There is no fee for the “dockage,” but there is a modest charge for power, and another for water, which total about $15/night. In 2015, the power pedestals were upgraded and fit with ground-fault sensing circuit breakers. Be aware that those breakers can expose pre-existing AC electrical problems aboard cruising boats. There are also actual slips farther west, but only a couple that can accommodate the depth requirements of cruising-sized boats. There is a private marina in the cove. There is also a sizeable anchorage in the cove, from which cruisers can dinghy into town. Summer weekends are very busy with local traffic. There are a couple of very nice restaurants, and many shops. There is a fine US Army Corps of Engineers Museum, focused on the history of the C&D Canal, about 1/2 mile walk. It is a very worthwhile and interesting visit. There’s a lot more to see and do on the Bay, of course, but the above “itinerary” will fill about two weeks at a comfortable pace. That assumes a couple of days at each stop, and three at Annapolis and Baltimore. I re-emphasize, the foregoing is just my opinion. That said, the Chesapeake Bay has many, many other venues and communities which offer wonderful opportunities for cruising and exploration. For those with more time to spend exploring the Bay, I’ve described what are, in my opinion, some of those locations here following. Visit Cape Charles, VA; this is a small town on the very southern end of the DelMarVa peninsula; the “Eastern Shore.” The town has a long history, and one that has been hugely affected by the forces of economic change over the decades. The harbor has a modern marina with floating docks. Town is easy walking distance where there are shoppes and an excellent Irish Pubs. Visit the Cape Charles Museum and Welcome Center, on Randolph Street, a moderate walking distance or easy bike ride from the municipal harbor marina. There is a fine marina on King’s Creek, a mile or so north of the municipal harbor, called The Oyster Farm. First timers should get local knowledge of access; the channel is marked, but narrow and potentially confusing to first-timers. Visit Yorktown, VA; obviously, there is a lot of Revolutionary War history in the region. The Yorktown Municipal marina on the York River is both reasonable and convenient to the city (walking distance), but it is exposed to heavy weather and York River ebb and flood currents. Alternatively, cruisers can stay at the York River Yacht Haven on Sarah Creek, off the north shore of York River, across the bridge from Yorktown in Hayes, VA. YRYH is relatively expensive for the region. Cruisers can also anchor in Sarah Creek, but that is really only a secure place to overnight. We like Crown Pointe Marina, on the Perrin River, north shore of the York River before the bridge, for this stay. Rent an Enterprise Car while there to visit the Yorktown-Jamestown-Williamsburg Historic Triangle. Take a day trip to Jamestown and visit the National Park and the privately operated park there. 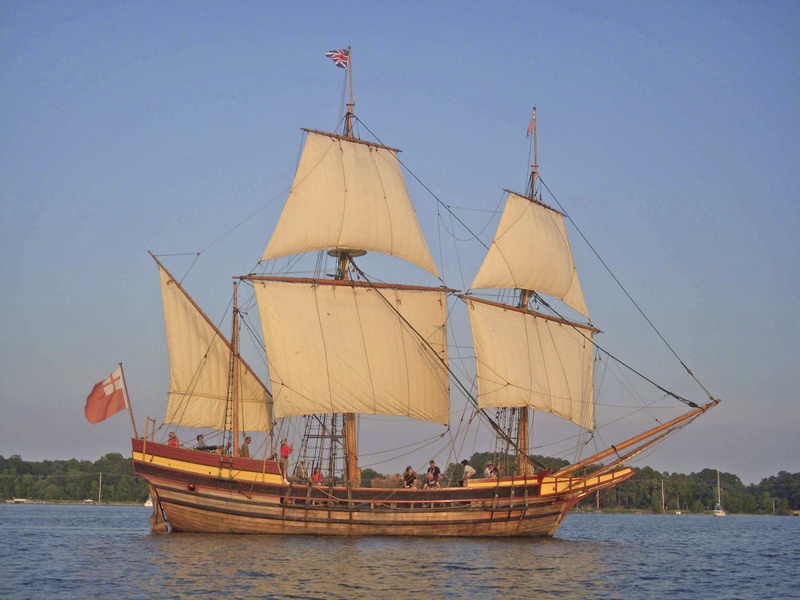 Jamestown is the home port of s/v Susan Constant, s/v Godspeed and s/v Discovery, reproductions of the three ships that brought English colonists to Virginia in 1607. Visit Williamsburg; the premier living-history museum of the Colonial period. Plan a week for this stop to see all three locations. Crown Pointe is a full service marina but is out in the country, and a car is needed. They have a very nice pool and laundry, and a full service maintenance yard. On the Eastern Shore in Virginia, some people like Onancock, VA. The run up Onancock Creek to the marina is lovely, and the marina is quite reasonably priced. There’s a very good restaurant at the marina’s landing. The town itself is at least a 3/4 mile walk. That walk is rewarded by a great, old-timish hardware store, and an ice cream shop; really not much more. Also on the Eastern Shore, visit Crisfield, MD; stay at Somers Cove Marina (state owned; reasonably priced; well protected; nice facility). This is a good place to take either a tour boat or the “mail boat” to Smith and Tangier Islands. The mail boat is much cheaper than tour boat, but requires an overnight stay on the Island, so plan ahead for accommodations if you want that option. Crisfield was historically a waterman’s village, but has “been discovered,” and now is a condo and retirement community. On the Western Shore, Deltaville, VA, and Urbanna, VA, on the Rappahannock River, are summer tourist stops. Deltaville has several excellent marinas and many boating service businesses. Some of the marinas have courtesy cars, and you do need a car to get around. There is a large, well-stocked West Marine and a smallish, but well stocked, local grocery store (handles re-provisioning needs) on the western end of town. Good local restaurants in both towns. Urbanna is more upscale and walkable from the marina. On the Western Shore of the Chesapeake Bay, 6 miles up the Potomac River’s north shore, is the St. Mary’s River. Visit St. Mary’s City, MD, on the St. Mary’s River. We think this is an outstanding stop. I would rate St. Mary’s City a *must see* stop except that it is somewhat out-of-the-way. No public marina dockage is available, but there is a large, moderately protected embayment there at Horseshoe Bend (N 38°11’30.7″, W 076°25’56.7″). The area is large enough for many boats, with good holding in 7′ – 15′ of water. Horseshoe Bend is fairly well sheltered from heavy weather. St. Mary’s City is the forth oldest permanent English settlement in America, and is today the home of a pre-colonial reproduction of the village that was to become Maryland’s first capitol. The reconstruction includes a Yaocomico Indian village, a branch of the Piscataway Indian Nation. St. Mary’s City was the earliest colonial settlement with a specific mandate welcoming both Catholics and Protestants, and a Catholic Cathedral was erected there. The cathedral reconstruction is solely a secular ornament in today’s historic village. Docent’s provide high quality interpretations of life in the village. The port at St. Mary’s City is the home port for s/v Maryland Dove, and the home of St. Mary’s College, one of Maryland’s “Honors Colleges.” Eat at the college dining hall where cruisers will find good meals at attractive prices. Plan at least a full day to visit the historic village. There are free “Music-on-the-Green” concerts every Friday evening in the summer, overlooking the Horseshoe Bend anchorage. See the college web site for details. Also use St. Mary’s City to stage for St. Leonard’s creek or to stage for cruising up the Potomac River to Washington, DC. On the Eastern Shore, via the Wicomico River, is Salisbury, MD. This is a rural, relaxing and peaceful river cruise. Salisbury is a working class town, with a very reasonable marina, and some good restaurants near the marina. Be mindful of the two, correctly charted, cable ferry crossings on the Wicomico River along that route. Call those ferries on VHF13/VHF16 to arrange to pass over the cables when they are lowered and lying on the bottom. On the Eastern Shore, via the Choptank River, is Cambridge, MD. The city marina is reasonably priced and protected from heavy weather. 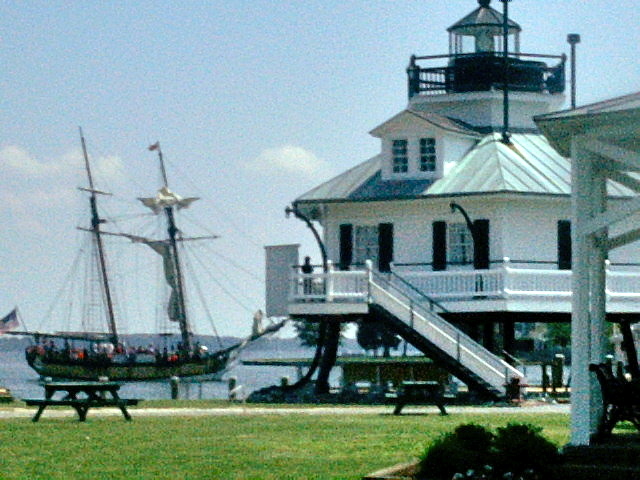 The harbor entrance is marked by the Choptank River Lighthouse, a reproduction “screw pile” lighthouse. This is a wonderful, relaxing working-class city with excellent seafood restaurants. On the Eastern Shore, Chestertown, MD, up the Chester River, is an excellent stop. There is a low highway bridge across the Chester River beyond which cruising boats cannot go. There is a small marina for transients. Many – most, actually – of the real estate properties in Chestertown are on the “Registry of Historic Places,” so if architecture is your thing, don’t miss Chestertown. The Chester River is a rural, quiet river. There are lots of places to anchor. 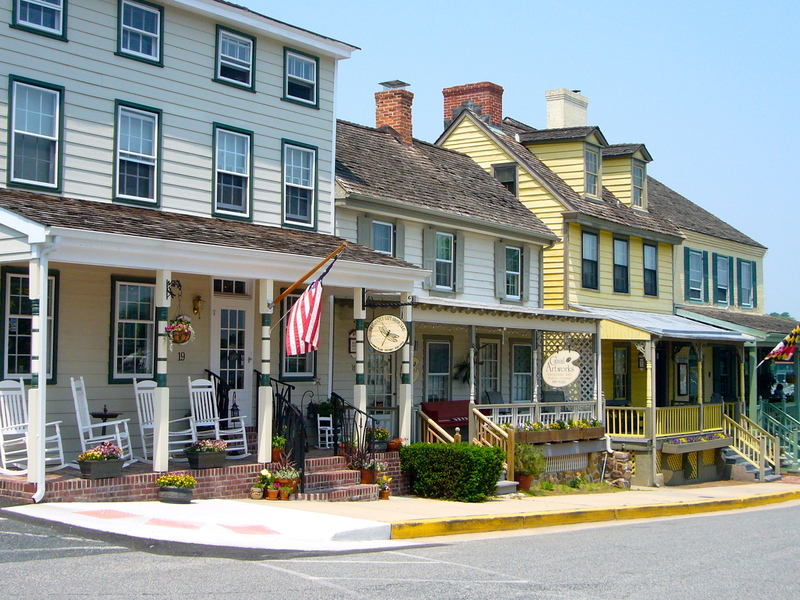 On the Eastern Shore, Rock Hall, MD, is a nice Bay village with nice waterfront restaurants. The main harbor has large, non-navigable shoal in it’s center, and access to shore is from a large, square-shaped channel around the perimeter of the harbor. Cruiser’s must stay in that channel. Restaurants with transient dockage for visiting boaters are quite good. Access to town from the main harbor is walking distance. Access to town via a local shuttle bus is available to cruisers who stay at one of two upscale marinas (Haven Harbor, Osprey) on Swan Creek. This area of the Eastern Shore is quite shoal, so visiting cruisers must honor charts and markers. This entry was posted in Chesapeake Bay on 2013/01/12 by gilwellbear. We were very pleasantly surprised by our entire 3-1/2 week Potomac/Washington adventure. 1. The Potomac is wide – *very* wide – and there are no significant navigation difficulties. There is a strong tidal flow that will affect you – either help if fair or hinder if foul. Washington is about 115 miles up the Potomac from the Smith Point – Point Lookout line on the Chesapeake Bay. That’s about half as far as Chattanooga is from the Tenn-Tom. On the Potomac, there are no locks and no gorges, but the scale of the Potomac’s vistas are amazing. 2. There are many good places to anchor and several marina choices along the way. 3. The marinas we encountered were more “affordable” than the marinas along the A-ICW; i.e., less expensive! Make advance reservations!!! All of these marinas are near each other and close to the city via public transportation. With New York (or Charleston or Savannah) prices as a benchmark, they are either an outright bargain or very reasonably priced. 5. One week will not be enough time to “see the town.” The “usual” sights include the Smithsonian Museums (there are nineteen of them) and other government buildings, The National Holocaust Museum, the Library of Congress, Arlington National Cemetery and the Tomb of the Unknown Soldier, The National Archives, The National Cathedral, The National Mall (National WWII and Vietnam War Memorial, Presidential Memorials, etc), and perhaps, Georgetown. 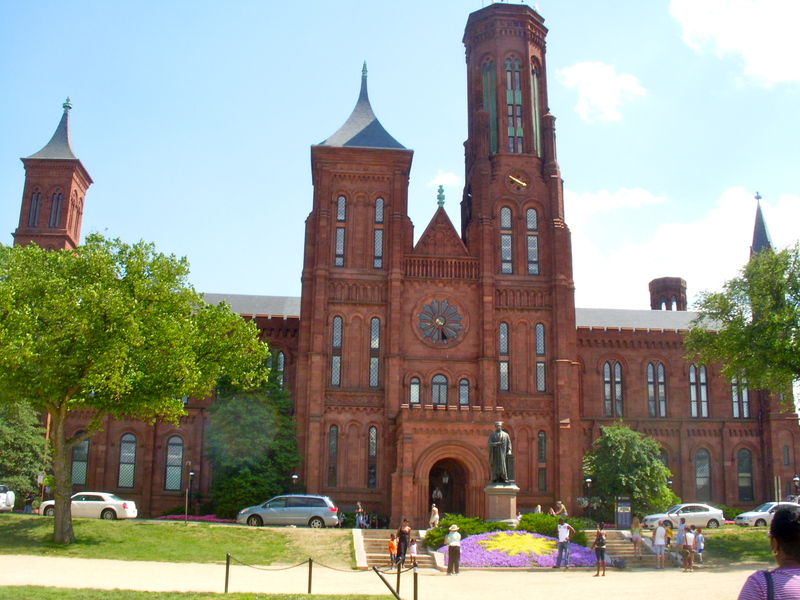 There are many private, for-profit museums and attractions you can pursue here. 6. If you have a car, or rent one, there is a Marine Corps Museum at Quantico, VA, about 40 minutes from the Washington Marinas. Admission is free. It is superbly done. 7. Upbound or downbound, you can dock for the day at George Washington’s Plantation at Mt. Vernon, VA, and visit the plantation site. Call ahead for instructions. Monday is best day; no tour boats are on the docks on Mondays. Use the south channel for best access (deepest approach depths). The north channel is more challenging and shallow. 8. There is a new (open 18 months) museum at Mt. Vernon detailing the plantation and the life of Geo. Washington. Excellent. 9. Upbound or downbound, there is a State of Maryland Honors College at St. Mary’s City. St. Mary’s City is on the St. Mary’s River, on the north shore of the Potomac, about 6 miles from the Smith Point – Point Lookout line on the Chesapeake Bay. Anchor in Horseshoe Bend and dinghy to the college’s docks. There’s a US post office and an historic restoration of the first Capitol of Maryland village, circa 1634, a la Williamsburg except more rustic. St, Mary’s College has a free “Concert on the Lawn” series on Friday evenings in the summer. Eat at the college dining room. Breakfast and lunch are $5.00 plus tax and dinners are $8.00 plus tax. All you can eat. Visitor’s are welcome. 10. Upbound or downbound via the Potomac River, stop and visit Freddie Olverson at his Lodge Creek Marina off the Yeocomico River. If you’re an MTOA member, he’ll give you one free night. He has a free Courtesy car for grocery/hardware shopping. Also upbound or downbound, there are fine, protected anchorages available at Mattawoman Creek, Aquia Creek, the Point Tobacco River, and St. Clement’s Bay, and a nice marina at Colonial Beach. This entry was posted in Chesapeake Bay, Potomac River on 2013/01/11 by gilwellbear. In Washington, DC, Sanctuary and crew stayed on the Washington Channel, immediately upstream of the confluence of the Anacostia River into the Potomac. The Washington Channel is a large, closed, rectangular embayment. 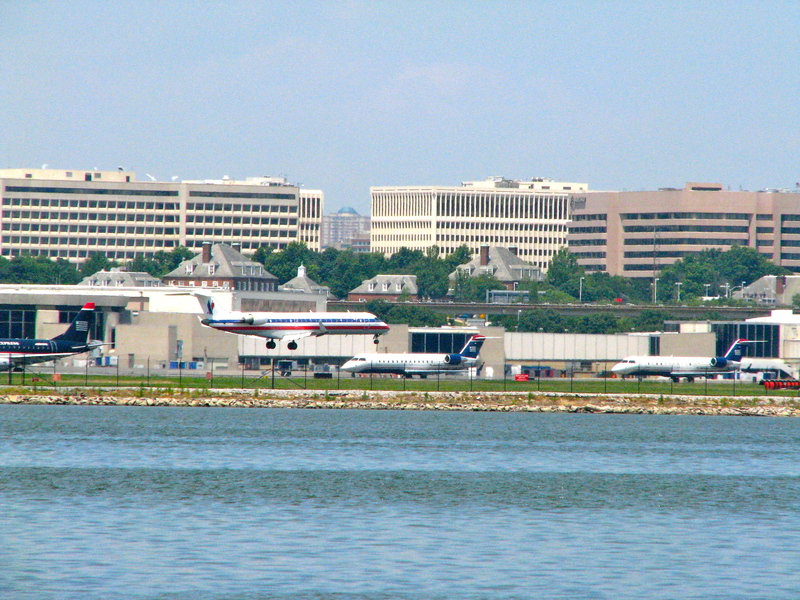 Water access is from the south end, across the Potomac from Reagan International Airport. 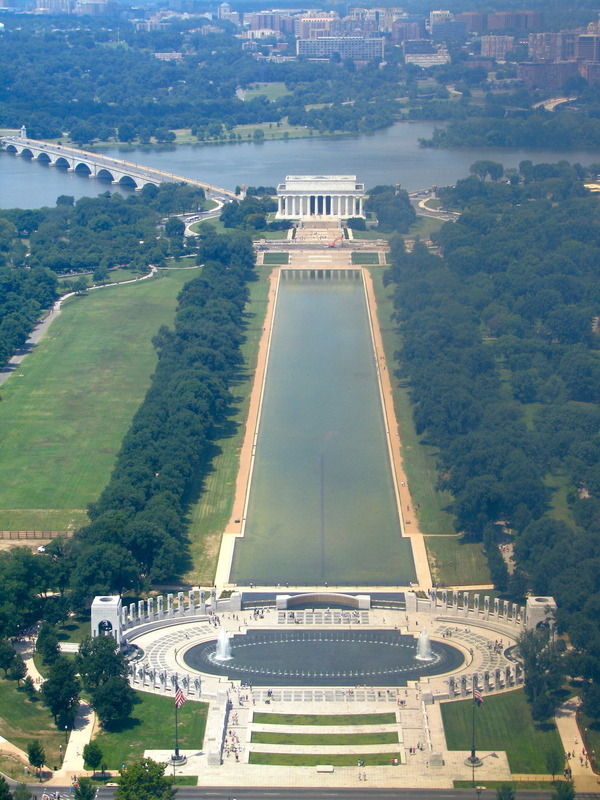 The Washington Channel is located along a VIP helicopter route that serves the White House and the US Capitol. There are frequent low-flying helicopter transits that occur at all hours. If that sort of activity is bothersome or triggers unpleasant memories, the Washington Channel basin may not be appropriate for your comfort. To get to the Washington Marina, your boat will have to be able to clear a fixed bridge (Constitution Avenue). Check the charts for vertical clearance. Sanctuary could have done it. Many trawlers and cruisers will clear; sails will not. These three facilities are all located on Water St., which parallels Maine Ave. The layout of their individual docks make their entrance gates 1/2 mile or more apart. Nearby local restaurants are all closest to the Capital Yacht Club docks. If you stay at the Washington Marina or Gangplank Marina, it’s a bit of a hike to get off your dock, over to the restaurants, and back. There is also a large anchorage at the NW end of the Washington Channel embayment, nearest the vicinity of the Jefferson Memorial and Reflecting Pool. Anchoring in Washington Channel is legal and free. There are no mooring balls and no water taxi/launch services. In late June and early July, there was plenty of room to anchor. If you anchor, you can use the dinghy dock and facilities of the Capital Yacht Club for a small fee per day; a good deal. The fee includes showers, laundry and trash disposal, as well as use of the bar and club house. The anchorage carries 10 – 20 ft throughout. Tides in the channel run 3 – 4 ft. Holding in the channel seemed good in a heavy mud bottom. We didn’t anchor, but in the two weeks we were there, none of the cruising boats anchored there had any problems, and we did experience passing thunderstorms every few days during that season. You will be accompanied by a dozen or more other cruisers anchored there. All anchored boats were occupied. It’s a well protected anchorage. The Washington Channel is separated from the main body of the Potomac River by a large spit of public park land. On the July 4th holiday, the harbor police may come along and ask you deploy a stern anchor so the boat doesn’t swing with the tide. That way, they improve safety and get more boats in for the National fireworks show, itself. Anchored cruiser’s will not be at risk. We observed that the crowds arrived in the afternoon and evening, and mostly broke up after the fireworks were over. The music program for the fireworks on the mall is simulcast on FM Radio. There is Safeway super market about 1/2 to 3/4 mile (3 or 4 city blocks) from CYC, on Maine Ave. I suggest visitors limit shopping to the mid-day hours on weekdays; certainly during daylight hours, and preferable in groups. The store abuts the Anacostia section of the city, in a transitional area located between yuppie, upper middle class neighborhoods and inner-city poor neighborhoods. You will see homeless sleeping on the public riverwalk in the late evening/early morning hours. They are not a safety or security problem for passersby, and are shoo’d off by metro police by 10h00. Security is very tight at all of the marinas, and we never worried about it in the two weeks we spent aboard. The docks are fenced, and keys are required to both get on and get off the docks. If you plan to stay at a Washington marina, make reservations, and make them well before you get to DC; it is not an easy venue for transient boaters, in the sense that there is a lot of local demand for slip space, and a very high percentage of long-term live-aboards in the local facilities. The marinas all put transients in slip space if/as season slip holders are away. We stayed at the Capital Yacht Club, which I recommend as the best choice of the three facilities. CYC is a private Club. If you happen to be a member of a Chesapeake Bay Yacht Club, they offer a small (maybe 10%) slip fee discount. As mentioned above, they have laundry machines, guest showers, dockside pumpout, a social room/dining room/club house and bar. They include and welcome transients in their social activities; while we were there, they had several pot luck dinners and breakfast on the week ends. We felt welcome and included. From very near Capital Yacht Club, on Maine Ave., there is a closed-loop bus route called the Washington “Circulator.” Circulator buses are painted fire-engine red. The Circulator that serves Maine Ave. will take you to the Metro subway station at L’Enfant Plaza or to the National Mall near-by the Smithsonian Air and Space Museum on Independence Ave. There is a second “Circulator” route that serves the entire perimeter of the National Mall – the capitol to the Jefferson Memorial – and some limited close-in areas of the city. The Circulators cost $1.00/ride. There is a good Chinese Restaurant located on the second floor of the CYC building, a good fresh fish place next door to the CYC property, and a high-end Phillips seafood restaurant next door on the promenade. It’s about 1/2 mile walk from CYC to the Holocaust Museum, and about a mile walk to the reflecting pool, Lincoln Monument, FDR Monument, Jefferson Monument, etc. It takes a little doing, but by metrorail and city bus, we were able to visit the National Cathedral. 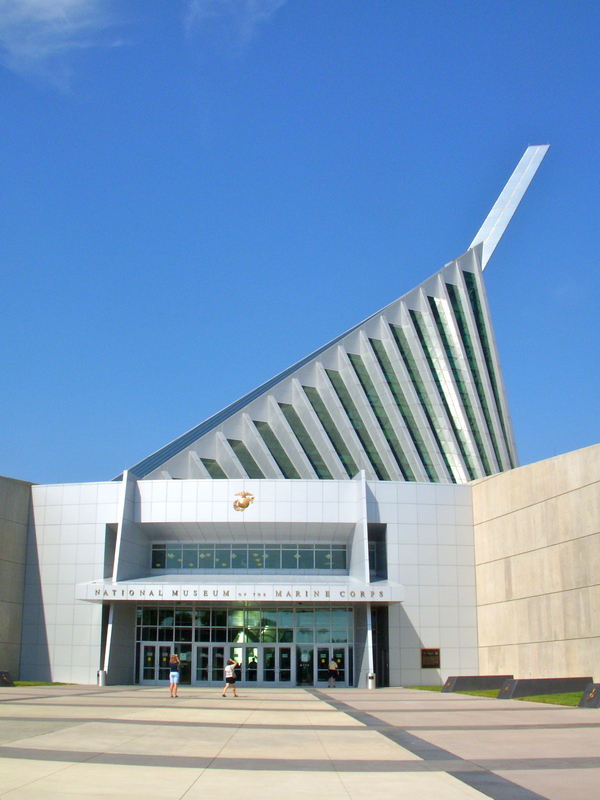 With a car, a visit to the US Marine Corps Museum at Quantico, VA, is extremely worthwhile. I discourage staying at the St. James Marina on the Anacostia River. The facility is modern and secure, but the area in which it is located is not appropriate for coming and going as a visitor to DC. The City of Alexandria operates a municipal marina, but it is several miles away from DC, across the Potomac, just north of the new Woodrow Wilson Bridge. The Wilson bridge is now open to traffic, and it’s predecessor is gone. Some cruisers do stay there, and use the DC Metro system to get into the city. We preferred to be closer. If you consider using the City of Alexandria’s Municipal Marina facility, be especially aware and careful about their refund policy; it is extremely onerous. It is clearly described on their web site, but anyone who considers using this facility needs to be aware of it. There is a new marina at National Harbor. It’s even harder to get into DC from there. It’s south of the Woodrow Wilson Bridge on the east shore of the Potomac. For access to DC, take their water shuttle across to Alexandria, and then take the Metro into the city. You can get further information from Skipper Bob and from the Waterway Guide, Chesapeake Bay edition (formerly Mid-Atlantic Edition). We used Skipper Bob, The Waterway Guide and Rick Rhodes guide on “Cruising the Potomac” for detailed cruising information. We think this side trip is a real pearl. It’s every bit as good as any other city stop on the east coast or the Great Loop cruise. The marinas are safe and secure. We enjoyed Savannah, Charleston, New York, Montreal, Ottawa, Chicago and St. Louis, and certainly Chattanooga. The Potomac River and Washington, DC, are equally well worth the effort. This entry was posted in Chesapeake Bay, Spare Parts, Washington, DC on 2013/01/10 by gilwellbear.